Tania Naranjo‘s and Minna Weurlander‘s paths crossed through their shared love of Tango Nuevo. It was of course more than just the geographical distance that separated Minna’s childhood in Finland from Tania’s childhood in Chile. Even so, their temperament and mentality are very much alike. The first album ENTWINED recived fantastic reviews. The Duo tours now frequently in Europe and Scandinavia. 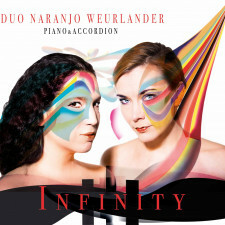 Duo Naranjo-Weurlander’s second album as a duo – Infinity – is a journey through their musical roots, as well as a collection of original compositions reflecting their individual lives and experiences.Their music is deeply personal – full of lust and nostalgia, virtuosity and restraint – creating a landscape of sound that presents the listener with an almost cinematic experience. After their first album – Entwined – the Duo have been touring extensively in and outside of Europe, performing at a large array of international venues. From world renowned concert halls and theaters to tiny jazz clubs – their powerful performances and compositions have impressed audiences and critics the world over.Both Naranjo and Weurlander have long been recognized as strong profiles and performers on the classical, world and jazz music scenes. Now they have also taken their place as composers in their own right. They have worked on music commissioned for radio, cinema and various ensemble pieces. Duo Naranjo-Weurlander is based in Sweden. Teater Sláva started following DUO NARANJO-WEURLANDER. Sousou Cissoko started following DUO NARANJO-WEURLANDER. Esbjörn Wettermark started following DUO NARANJO-WEURLANDER. Mix Musik started following DUO NARANJO-WEURLANDER. Emues Crew started following DUO NARANJO-WEURLANDER. DUO NARANJO-WEURLANDER started following DUO NARANJO-WEURLANDER.